Choosing a good water pump for your aquarium is important for giving your fish an exceptional environment to live in. Because your fish spend every day in the same tank and are exposed to the same water daily. You need the best aquarium water pump you can find to keep the water moving throughout their tank and reduce the chance of bacteria growth and build-up of harmful residues along the tank. These hazards need to be taken care of to ensure that your fish get the most natural and clean environment that they can thrive in. 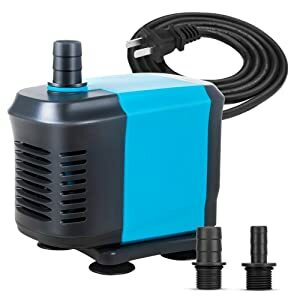 Where Do I Put the Water Pump in My Aquarium? 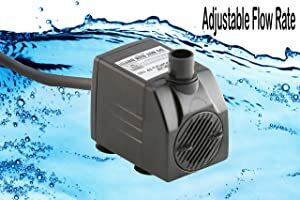 How Do I Install the Aquarium Water Pump? When choosing an aquarium water pump, you need to think about what functions your fish need in your tank. Water pumps are used for different reasons, like draining and filling your tank, moving water through the tank’s filtering system, and can even be used to make waves in your tank to keep everything moving nicely for the fish. Once you decide which features you need in your aquarium, you can move onto other details of the pump. You need to factor the size of your tank and amount of water you need pumped before choosing a water pump. Generally speaking, your water pump should be able to rotate the water in your tank about five times in an hour. This means that if you have 10 gallons of water in your tank, your water pump should ideally perform at a minimum rate of 50 GPH to ensure efficiency and thoroughness cleaning. You can also decide if you prefer an in-line or submersible pump for your water tank. In-line pumps are external pumps outside of the water, while submersible pumps function underwater in the sump of your filter. Thinking of these qualities beforehand is essential to finding a good water pump. Finding a water pump that meets all of your needs can be tricky, especially if you’re new to the aquarium world. Luckily, the table below has taken a lot of the guesswork and research out of finding the best & quietest water pumps (submersible water pumps) on the market today, and can be used to help narrow your search. First, we’ll take a look at the KEDSUM submersible water pump. 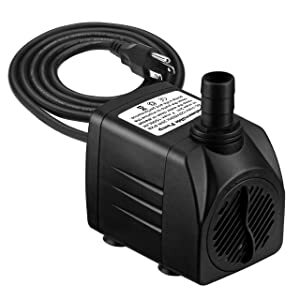 This pump is suitable for both freshwater and saltwater tanks and can be installed with suction cups vertically or horizontally on the sides of the tank or walls of the pond. This pump definitely packs a punch despite its small size, as it functions at a powerful rate of 660 GPH or 3,000 liters an hour. The KEDSUM water pump is also very energy-efficient and is ideal for tanks and ponds because it can be easily hidden or placed out of site due to its small size. The only thing going against the KEDSUM water pump is the fact that it may not be suitable for the sensitive fish in your tank or pond because it requires a little lubrication to function properly. If your fish are still very young or are just more sensitive naturally, you may want to keep an eye on them during the first couple of days of using this water pump. Next, we have the Homasy submersible water pump. This pump is also very powerful and runs at a great rate of 400 GPH. It’s suitable for use in tanks, fountains, and spouts and hydroponic systems. It also comes with a warranty of 12 months in case you find something out of order. The Homasy water pump is a good choice if you’re looking for a pump that works well, even in low water amounts. It can run up to 48 hours with dry burning, so you don’t have to worry about your pump malfunctioning if you’re gone for a few days and can’t add more water to the system. The problem with the Homasy water pump is that it can easily get clogged or blocked by large debris, which why it’s necessary to detach and clean the shafts and filter once every month. The pump also uses less power to push the water, making for weaker flow and currents. The VicTsing submersible water pump is also a good contender for an aquarium pump. This pump offers more customization to how much pressure you want to have in your water flow through the filter. There’s an easy-to-use turning knob that lets you control the water flow. The VicTsing water pump is also very small and easy to conceal in your aquarium, and operates very quietly, adding to the easy-to-hide nature of the water pump. It’s a good pump to start off with if you have a small tank because it’s simple to install and understand its functions. 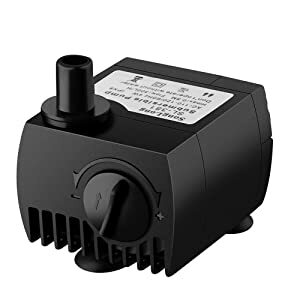 It’s important to mention that the VicTsing water pump has a low rate of 80 GPH, so if you have a larger fish tank, this may not be the right pump for you. It also requires maintenance every month, so that’s an important thing to consider if you’re busy and don’t have extra time to clean the pump. Next up is the Tiger Pumps submersible water pump. This pump is designed to work well underwater and can be placed vertically or horizontally on your tank. It’s got a pretty good pumping rate at around 120 GPH and is easy to install and detach when it comes time to clean the filter and shafts. A big plus for the Tiger Pumps water pump is that it comes with a money-back guarantee, so if it doesn’t work out for you, you can get a full refund for your money. Coming in with an extremely powerful flow rate of 660 GPH is the FREESEA submersible water pump. This pump may be small, but it definitely has the power and functionality of any larger pump with its GPH rate. It’s perfect for use in all types of settings, whether that’s a tank or a pond. Because it has bottom suction training, the FREESEA submersible water pump is very easily submersible and can attach to nearly any surface. On top of that, it’s backed by a reliable 12-month warranty, so you can always fall back on that if you find a defect or problem of some sort. While the FREESEA submersible water pump has a lot of offer, it’s still important to consider that it won’t function well at all if it’s running dry. You really have to be careful to include enough water for this pump, or else it doesn’t function nearly as well as it’s supposed to. It’s important to have enough water to run with any pump, but more so for this one. Last, but not least, there’s the Uniclife submersible water pump. This water pump functions at a good maximum rate of 400 GPH. It’s very versatile in its uses and works well in both indoor and outdoor settings, such as tanks, ponds, fountains, and other hydroponic systems. The Uniclife water pump is very user-friendly, with easy to install and detach headings, as well as easy-to-understand instructions for cleaning and maintenance and controllable water flow. This pump is another one of those pumps that just can’t function without the right amount of water. Dry running this pump can cause early malfunctioning, and reduce the lifespan of the product. If you travel often or aren’t home to oversee your water pump much, consider a different product that can still take the brunt of running dry. From all of these good options for water pumps, there is one that stands out the most among the others for its excellent features and great design. The KEDSUM water pump takes the cake for having the quietest water pump from the bunch. Not only that, but it also has a very powerful GPH rate, something that’s ideal for bigger tanks and ponds, and can be used for more than just filtering. The KEDSUM water pump is also great because it’s energy-efficient, and who doesn’t want to save some money from lower energy consumption rates? All in all, the KEDSUM water pump has a lot to offer and makes for a water pump that delivers good performance with a quiet, seamless design. Now that you’ve found a good starting point for what to look for in a water pump, it’s a good idea to understand just how your water pump works. Exactly how your water pump functions depend on the type of pump you have. Generally speaking, all water pumps have the main function of getting water in and out of the tank’s filtration system. This can be done magnetically, with air force, with propellers, or with the use of rollers. The components of your water pump work to create pressure that pushes the water through the filter, as well as create a pulling force to extract it back out. If your pump is working well, it should be able to complete this process with all of the water in your tank several times an hour. Where you put your water pump in your aquarium depends on what kind of pump it is. If you use a submersible water pump, you can attach it anywhere in your water supply, as long as it’s completely underwater. Because these types of pumps utilize suction cups, you can pretty much put it anywhere the suction cup holds and can remain submerged. For in-line or external pumps, you have to keep your pump dry and out of the water for it to work properly. An in-line pump oftentimes requires extra installation services because it needs to be installed out of the water without the use of suction cups, as is done with submersible water pumps. In-line pumps can also be installed by drilling a hole into your main filter sump, allowing the systems to connect, yet still function independently. You can utilize the services of an installation technician to get the best idea of where to place your in-line pump if you’re unsure of how to proceed. This leads to the topic of how exactly to install your aquarium water pump. Again, this depends on the type of water pump you have. Submersible water pumps are pretty easy to install because you just have to stick the suction cups to an area capable of holding them. These should keep the water pump submerged and in place, and once your suction cups hold, your water pump has been installed! As far as external water pumps go, you need to find a place to securely attach your water pump so that it doesn’t come in contact with any water. You can do this by installing a priming pot and a pump box near the water. Alternatively, you can install the pump directly into the filtering system by drilling a hole into the sump filter if you’re experienced. If all else fails, you can recruit an installation technician, especially for bigger filters that require more groundwork, to perform this service for you. Unless you have a huge body of water you’re trying to filter, your technician can complete this service for you within a day or two. Keeping the water your fish live in clean is the number one way of keeping them healthy. Now that you know a little bit more about what to look for in a good water filter, as well as a few good contenders and how/where to install them, you’re on track to get your own water pump that meets your needs, and ultimately, give your fish the best environment possible. If you keep the water clean and provide your fish with a nutritious diet, chances are that your friends have a long and carefree life ahead of them. It all starts with the water pump, and the love and time you put into caring for them.